2016 AAUS Lee Somers Internship – Final blog! This is my last blog! 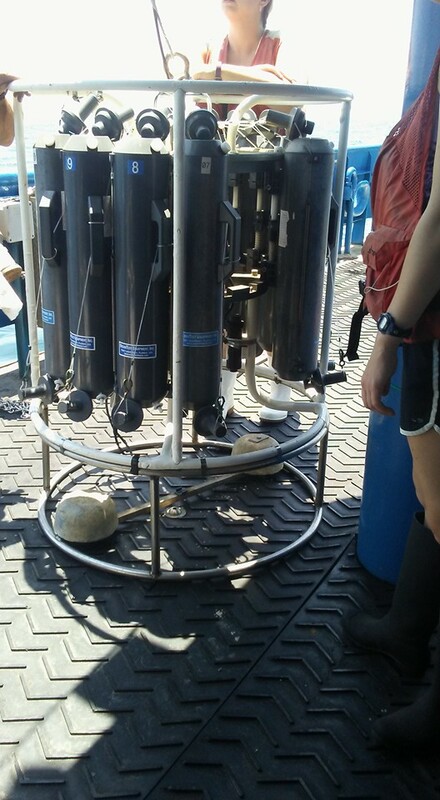 During the 8th week of my internship I was finally able to do some scientific diving! I drove from Savannah, GA to Pensacola, FL where I met up with some folks conducting lionfish trapping research. 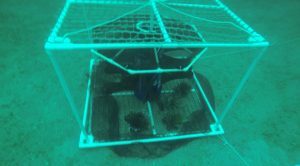 Dr. Steve Gittings from NOAA National Marine Sanctuaries designed a non-containment trap which will hopefully be used in the commercial fishing industry to catch lionfish from depths too deep for recreational scuba spearfishing. Spearfishing is currently the only way to catch lionfish which means that the lionfish in shallow waters are being culled. However, the fish in deeper waters are still able to reproduce and repopulate the shallow reefs consuming a lot of small fish and invertebrates. 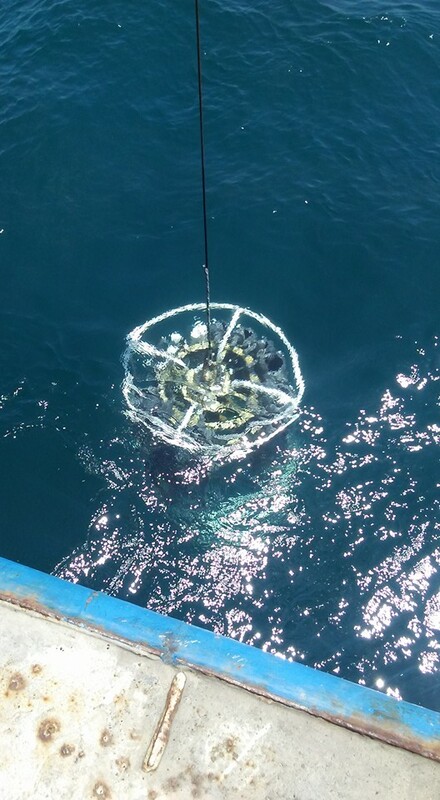 Steve has been working to create a trap that can be deployed, attract lionfish, and catch the fish only as the trap is pulled up. 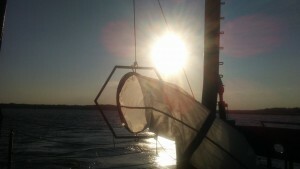 The trap is comprised of a Fish Attraction Device (FAD) inside a frame with a curtain net. Our first task was to assemble four of the curtain traps for deployment. Dr. Steve Gittings, Alex Fogg, Dr. Scott Noakes and I along with Bryan and Anna Clark, the founders of Coast Watch Alliance worked until late Sunday preparing the traps. 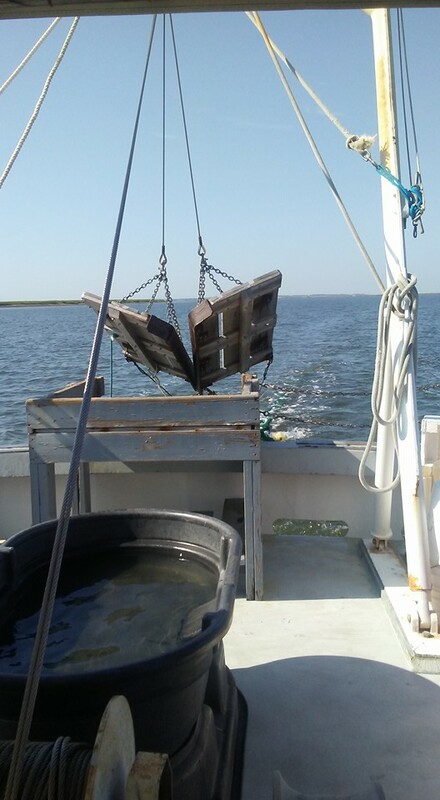 Coast Watch Alliance provided us with lodging on Pensacola Bay and coordinated with Escambia County to transport the traps to an offshore site approximately 18 miles offshore. 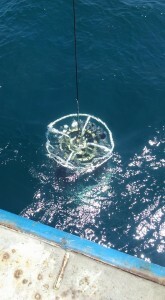 During the following week, we spent 3 days diving off the Pensacola, FL coast deploying and monitoring the traps. 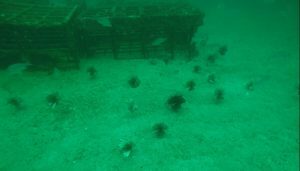 Our dive site was in about 110ft of water and there were 4 chicken coops which had been sunk by fishermen to attract fish. There were 3 coops grouped together, and a single coop about 50ft away. 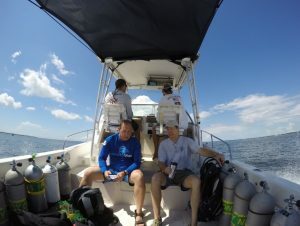 On the first dive we counted about 100 lionfish on the 3 coops and 50 on the single coop. We deployed 4 traps next to the 3 coops: 2 traps within view and 2 traps about 100ft from the first two that could not be seen from the coops. Overall, the traps were very effective. Throughout the week we “caught” about 65% of the lionfish at the site. 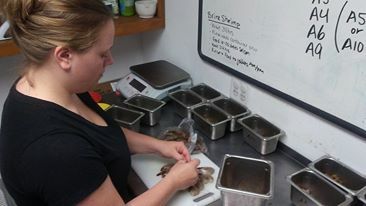 Instead of bringing the traps back to the surface, Alex caught the lionfish associated with the traps by spearfishing. 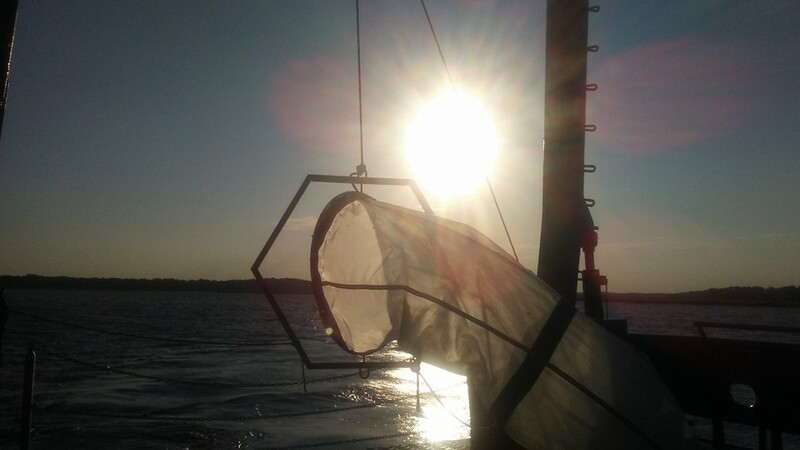 Since the traps are non-containment traps until they are pulled out of the water, we visually inspected the traps for potential bycatch and found none. 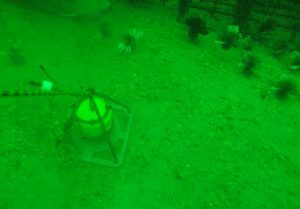 We noticed that the fish were attracted to the traps immediately, but the frame and FAD were too close together and the lionfish were mostly around the trap, rather than inside of it. 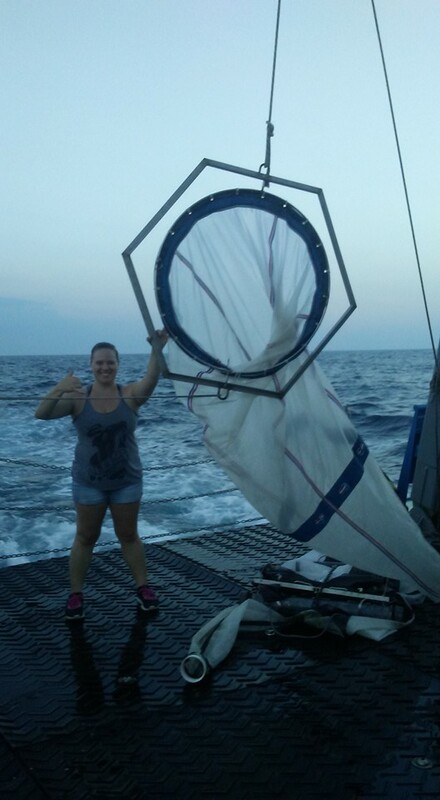 However, this was considered a great first run of the full-sized traps since it pulled the lionfish away from the reef site. Steve has been working with smaller versions of the traps in Little Cayman for a couple of years. Several new design modifications are being considered and will be tested on the next trip to Pensacola. 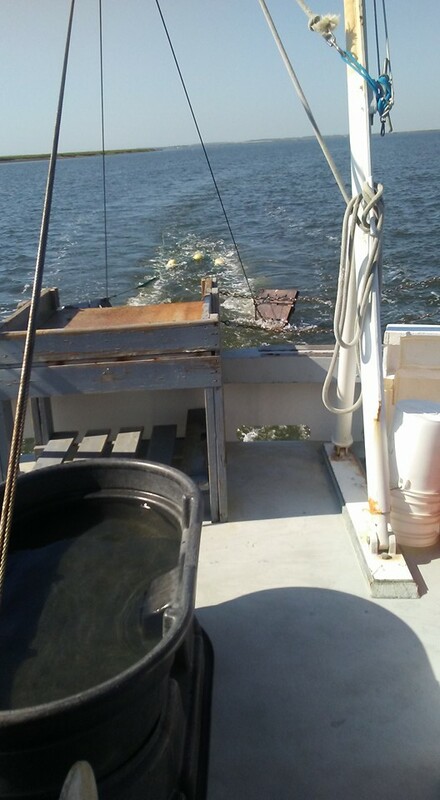 My advisor, Dr. Scott Noakes, was also recording the noises near the 3 chicken coops using a hydrophone. He is hoping to identify some of the in situ noises that lionfish make to better understand how the lionfish communicate and what attracts them to the reefs. I truly enjoyed this dive trip! It was incredible to work on lionfish research with this group of scientists. Additionally, during our time in Pensacola, we met with various people to promote the research and the consumption of lionfish. We met with Fred Garth from Guy Harvey Magazine to explain how these traps could be transformed into a commercial fishing device. We also met with Edible Invaders, the company that created Lionfish Dip, which is being sold in stores and restaurants in Pensacola, FL. Humans are considered the only predator to lionfish in the Atlantic, so it is important that consumers know that this is a safe fish to eat, even though its spines are venomous. Also, by creating a demand for this fish, it will drive removal of lionfish from the reefs where they are decimating the native fish and invertebrate species populations. My last two weeks at Skidaway Institute of Oceanography were relatively mellow. 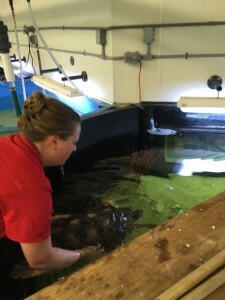 I continued to work at the UGA Marine Extension Service Aquarium (MarEX Aquarium). Most of the work an aquarist does involves feeding fish or cleaning up after them. The MarEX Aquarium focuses on education, but they are also involved in some research as well. I cleaned various tanks while working there. Cleaning the tanks involves siphoning out about 60% of the water and using a vaccum siphon to clean the gravel without removing it. The fun part of tank cleaning is getting to redecorate the tank after it is clean. I have included a photo of the seahorse tank after I cleaned and redecorated it. 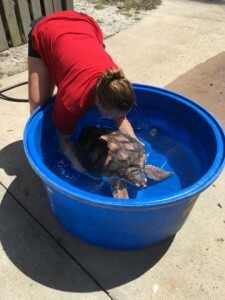 I was also able to weigh the one year old loggerhead turtle, Lefty. The turtles are fed based on their weight, which is why it is important to monitor their growth. There are two different methods of feeding in the aquaria, broadcast or target feeding. 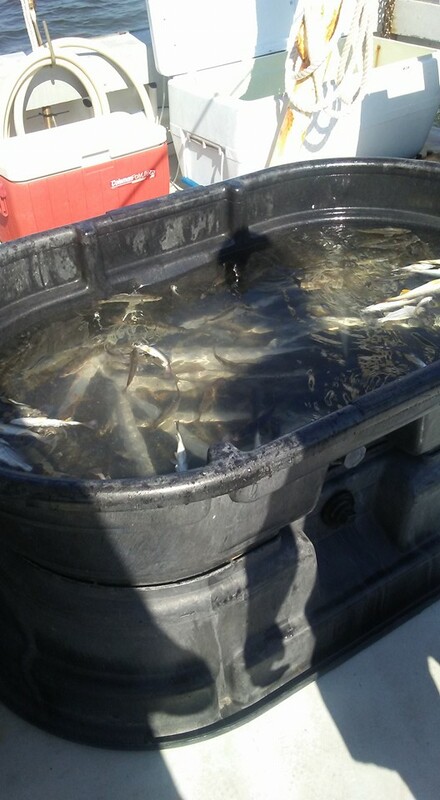 Broadcast feeding is when the food is sprinkled throughout the tank for the fish to eat and target feeding is when food items are given to a specific organism. Usually target feeding is done by sticking the food on the end of a pole and placing the food directly in front of the organism, which is how the gar, lobster, eel, terrapins and lionfish were fed. Other methods involve using tongs, which is how the turtles eat, or by training the organism to come to a tray to eat, which is how the bonnet head shark was fed. 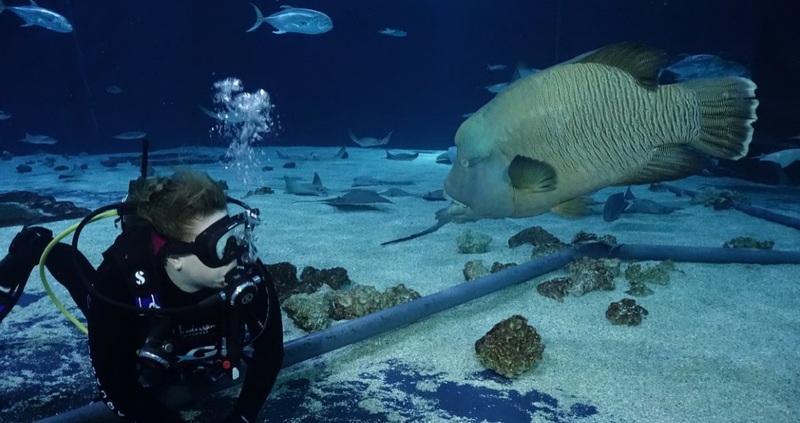 I really enjoyed feeding activities at the aquarium, but sometimes the fish that are target fed are picky and will not take the food and that can be frustrating. My sister came to Savannah for the last couple of days of my internship and The MarEx Aquarium allowed her help with some behind the scenes tasks. I am really thankful that I got to work with Devin and Lisa at the MarEx Aquarium this summer; it was a lot of fun. My sister and I drove back to Colorado on the 7th of August. 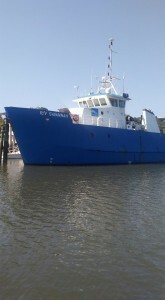 This internship was not what I had expected and I learned that diving off the coast of Georgia can be difficult due to sea conditions and boat availability. 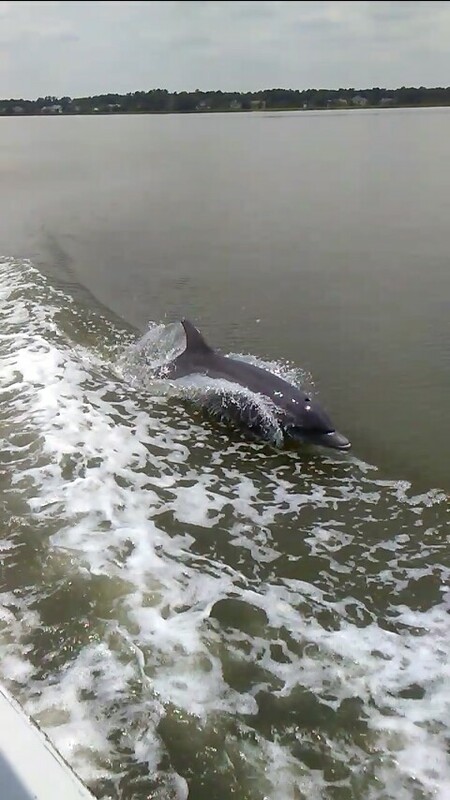 However, I did get an excellent opportunity to experience coastal living and participate in several marine related projects at Skidaway and MarEx. I am looking forward to presenting about this internship at the AAUS 2016 Symposium in Rhode Island! I will be starting a Master of Marine and Environmental Affairs program at the University of Washington in a couple of weeks. I am very grateful for this opportunity through Our World Underwater Scholarship Society and the American Academy of Underwater Sciences! This entry was posted in 2016 AAUS, Current Internships on October 8, 2016 by Allie Sifrit. The summer is flying by! I have been working at the MarEx aquarium at Skidaway Island a lot since my last blog. I have learned so many things. 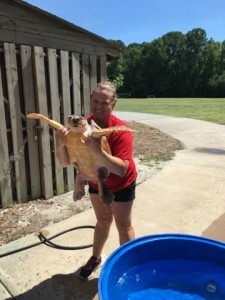 I have been on reptile duty for a few weeks wihch includes cleaning the filters in the mud turtle, snapping turtle, and diamondback terrapin tanks, as well as providing fresh water for the snakes and lizards. I also get to feed these reptiles on occasion. At the aquarium I also help by cleaning protein skimmers and tanks and by feeding the fish. I went with the MarEx Aquarium to Beach Week on Tybee Island, which is sponsored by the Georgia Department of Natural Resources. 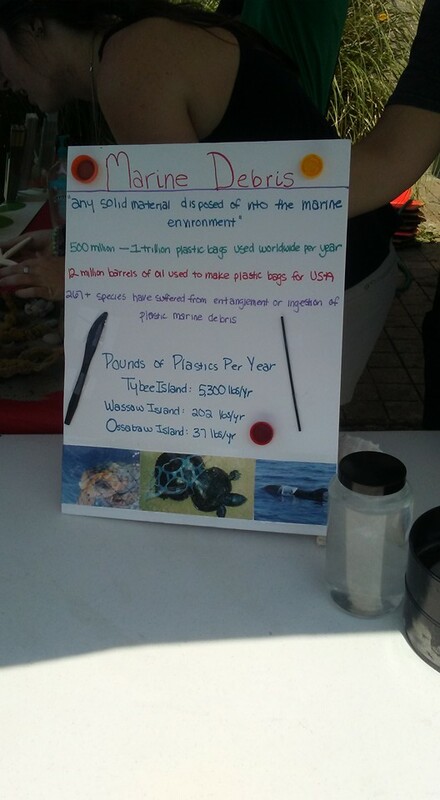 Our theme was marine debris education and I created posters, helped design an activity, and played a game to speak to beach-goers about marine debris. It was a lot of fun! 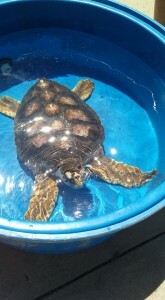 The MarEx Aquarium has two loggerhead turtles on display. One of whom is a three year old named Rider and it will be released into the wild soon. 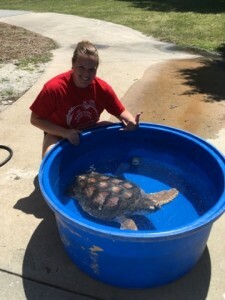 I was also able to aid in some sea turtle husbandry this week. 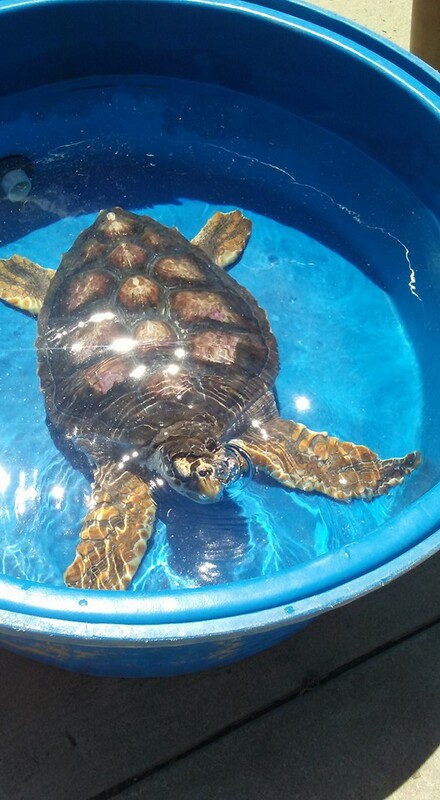 I helped take Rider out of the tank and carry it to a small pool outside so that Rider could have a sun bath. The aquarium has UV lights above Rider’s tank, but there is nothing quite like real sunshine! MarEx Aquarium also has weekly summer camps for kids. 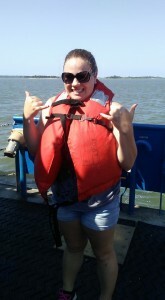 I was able to go fishing and trawling with the summer camp groups as a volunteer camp counselor. 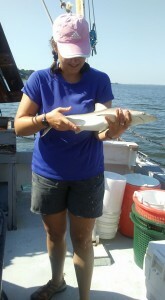 During the fishing trip my group caught: 18 sharks, 2 stingrays and a blue crab! 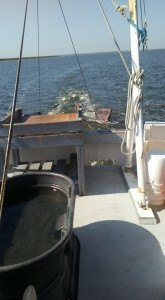 The trawling trip was aboard the Sea Dawg, a MarEx vessel and we caught sharks, crabs, shrimp and various species of fish. I really enjoy spending time teaching children about marine and aquatic organisms. This summer I have also been working with Dr. Marc Frischer, a SkIO faculty member. 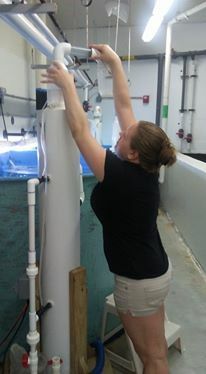 One of his graduate students, Ashleigh, is working on black gill shrimp research. She is doing mortality experiments on local shrimp to study black gill. Some shrimp get their gills infected with a ciliate which causes an immune response of producing melanin, thus turning the gills black. I help with daily shrimp counts where we check the shrimp for black gill and feed them. If a shrimp dies, it gets measured and the gills are preserved for future molecular work. I helped Ashleigh break down the first experiment last week, and then went on a collection trawl in order to start the second experiment. I was also able to go on a research cruise with the Frischer lab as well. SkIO has a research vessel called the Savannah and it has a huge A frame and J frame winches for trawling, plankton tows and CTD casts. 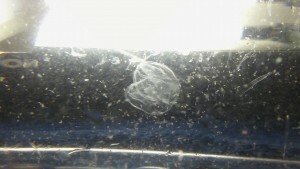 We spent 2 days on the ship doing plankton tows and CTD casts looking for gelatinous plankton called Doliolids. 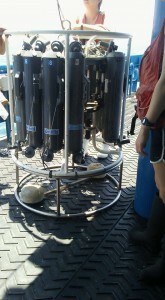 We did not find any Doliolids on the cruise even though the water conditions were good. We did catch some ctenophores in the plankton tows, which was pretty cool. The research cruise was a blast. I am looking forward to the last 3 weeks of my internship! I will be traveling to Pensacola, FL next week to do some diving (finally!). 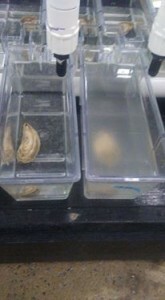 The oyster on the right is a male and has just spawned! Rider getting a sun bath! This entry was posted in 2016 AAUS, Current Internships, Internship Journeys on August 15, 2016 by Allie Sifrit. 2016 AAUS Lee Somers Internship – Week One! 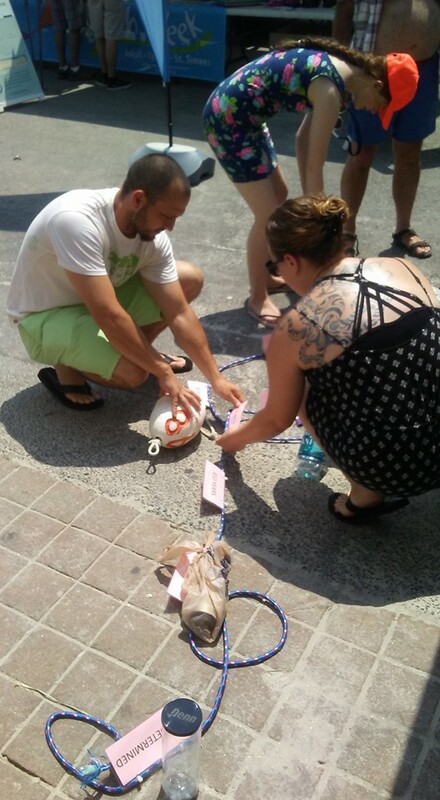 My 2016 OWUSS-AAUS Lee Somers Scientific Diving internship began with a road trip from Aurora, Colorado to Athens, Georgia. The trip was long, but I am excited to be here now. The first week of my internship was dedicated to getting all of the necessary paperwork and dives completed in order to process my Letter of Reciprocity (LOR) as an AAUS Scientific Diver with the University of Georgia (UGA). 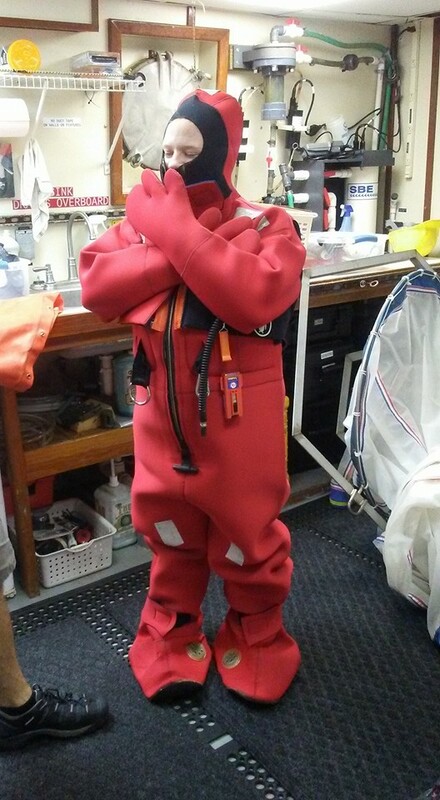 I have been working with Dr. Scott Noakes, the Diving Safety Officer (DSO) for the University System of Georgia. Scott took me on a tour of the UGA campus on Monday. The UGA Marine Science building has an indoor pool, which is where I did my confined water check-out dive with Scott on Tuesday. Then, on Wednesday we traveled to Lake Jocassee, which was about two hours away in South Carolina. We met one of Scott’s students from his recent semester-long scientific diving course at the lake and we did three dock dives. 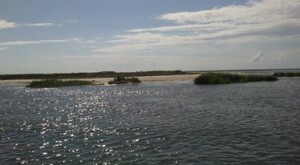 The lake was very cold, probably the coldest water I have experienced to date. We were able to hit 105ft maximum depth in the lake, which was pretty awesome and very cold. My next big adventure was on Friday when Scott and I drove to Atlanta, GA to visit the Georgia Aquarium which is also an AAUS institution. 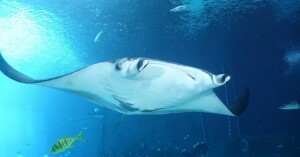 The aquarium is very impressive and has the second largest exhibit in the world. The Ocean Voyager exhibit holds 6.3 million gallons of water, four whale sharks, manta rays, and many more incredible marine organisms. Scott and I were able to dive in this exhibit during the daily dive shows that the dive program staff and volunteers put on for the aquarium guests (see photos). The dive locker for the Ocean Voyager exhibit at the Georgia Aquarium was massive. They set us up with their dive gear and we hopped in. Diving in Ocean Voyager was incredible. 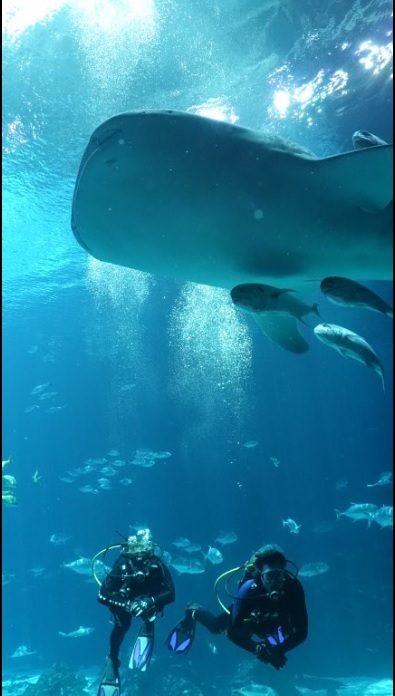 It is not particularly realistic because of the diversity and the quantity of fish in the exhibit, but it was truly a VIP diving experience and I thoroughly enjoyed my time visiting the Georgia Aquarium. We also watched the aquarists feed the whale sharks in Ocean Voyager and then toured behind the scenes of the Tropical Diver exhibit and peeked in the massive filter room for Ocean Voyager. The Georgia Aquarium is truly a great facility which works to spread conservation messages, teach people about the threats to the world’s oceans and they also conduct various field research projects. Next, I will be traveling to Skidaway Institute of Oceanography in Savannah, Georgia where I will spend the remaining time of my internship working there and diving offshore of Georgia. I drove from Athens, GA to Savannah, GA which was about 4 hours in order to get to Skidaway Institute of Oceanography (SkIO). I will remain here at SkIO until August 7th. 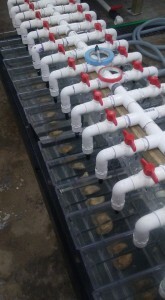 I have mostly been working with the UGA Marine Extension (MarEx) Aquarium. The MarEX Aquarium is an educational aquarium with 16 tanks of marine organisms that can all be found along the Georgia Coast. I have been helping feed the sea turtles, sea horses, and sea jellies as well as cleaning acrylic tank windows and protein skimmers. 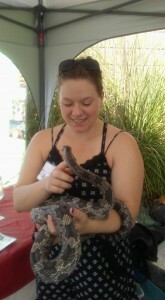 I am also responsible for the reptiles which are not on display. They have a few different snake species, mud turtles, a diamondback terrapin and some lizards. The MarEx Aquarium also leads week long summer camps for kids of varying ages. I was able to go with the summer camp to Wassaw Island, which is only accessible by boat and is a National Wildlife Refuge. We spent the day beach combing, swimming and we also did some seine net fishing for the kids to see the sea creatures. During the time I am not helping the MarEx Aquarium, I have been volunteering elsewhere around SkIO. The Gray’s Reef National Marine Sanctuary (GRNMS) has an office on SkIO and I attended their “Get Into Your Sanctuary” event. 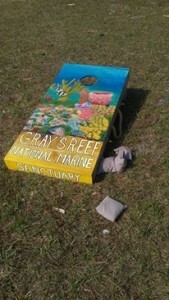 This was a nation-wide event on Saturday June 25th where National Marine Sanctuary Offices held outreach events to publicize the sanctuaries. 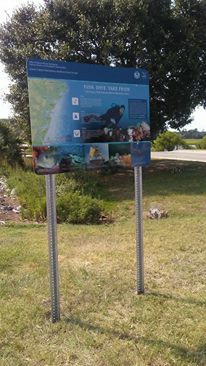 The GRNMS office unveiled new informational signs which were put up at boat ramps along the Georgia Coast. 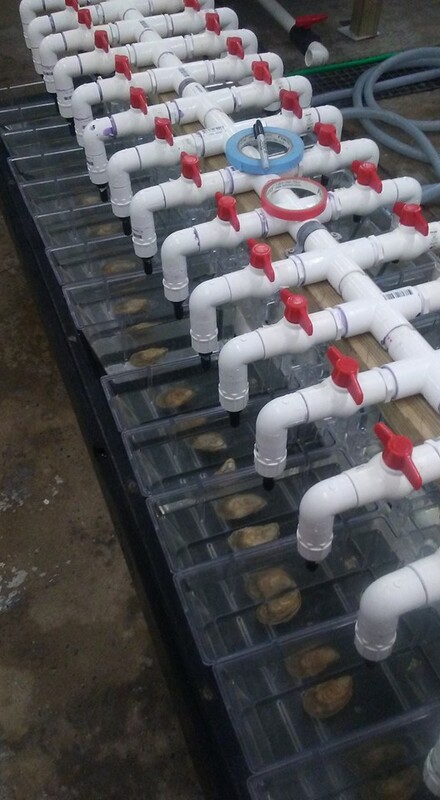 Additionally, I am helping the MarEx shellfish lab with a few projects. 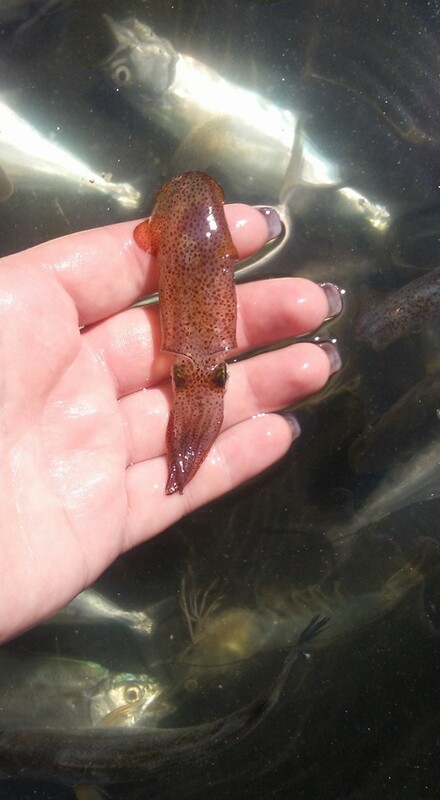 I helped with a small scale oyster spawn for the oyster hatchery and I have been helping with a black gill shrimp experiment. 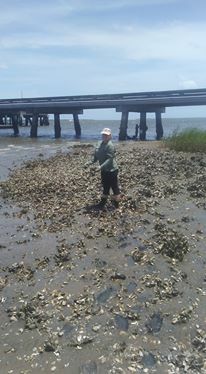 My roommate at SkIO is doing research involving intertidal crabs, so I also helped her collect oyster clusters from the salt marsh, and go through the clusters to find mud crabs and other small crab species. I have been quite busy with various groups around SkIO and I am looking forward to upcoming field work opportunities. Diving on the Georgia Coast has turned out to be quite difficult. GRNMS is about 40 miles away by boat and the seas have been too rough for us to get out there to dive, but hopefully I will get to go diving soon! 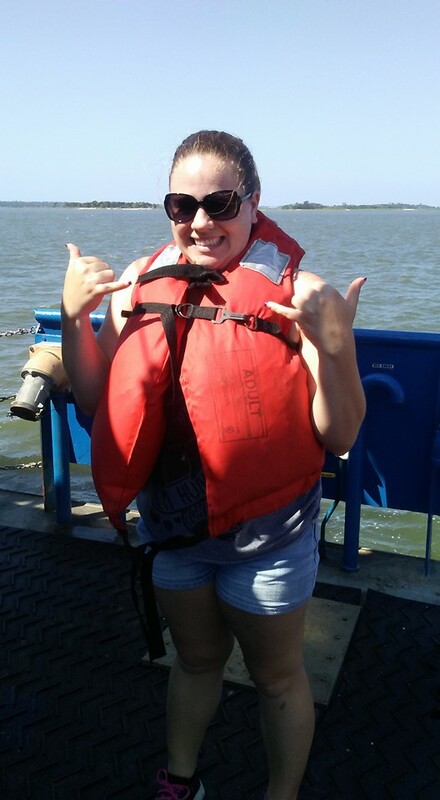 This entry was posted in 2016 AAUS, Current Internships on July 19, 2016 by Allie Sifrit.